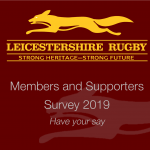 Please complete our annual survey! Leave a Comment on Please complete our annual survey! 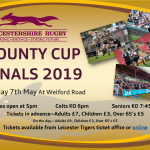 Under 14 and Under 15 County Cup Finals on Sunday 14th April 2019. 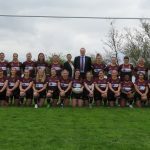 Thank you to Market Bosworth for hosting the two games. Under 14 – Market Harborough RFC 42 v Vipers RFC 5 Under 15 – Oakham RFC 12 v Hinckley RFC 10 Well done to all teams that took part.